The warmer months are just ahead of us and we can’t think of a better way to spend our days than lounging around by the crystal blue waters, sipping on mojitos and defrosting in the Florida rays hitting South Beach this summer. 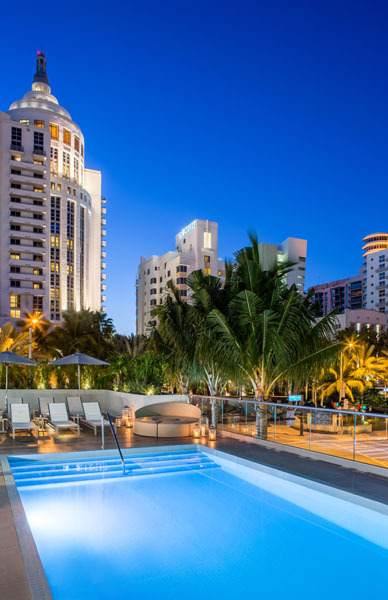 Hyatt Centric South Beach Miami is the quintessential Miami hotel, situated steps from the sand, diverse culinary scene and shopping on the infamous Ocean Drive. 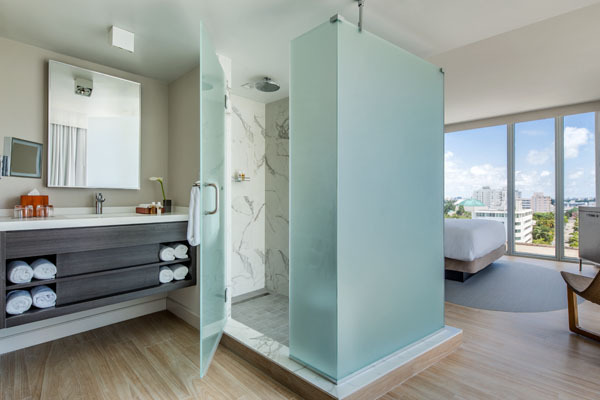 The hotel lives in a sleek 10-story glass tower, allowing for plenty of natural light, as well as the option to soak up some Florida rays on the third-floor rooftop pool deck, while sipping on a mojito from DECK Sixteen. Guests will revel in luxury with access to beach service via an attendant, including chaise lounge chairs and fresh towels. 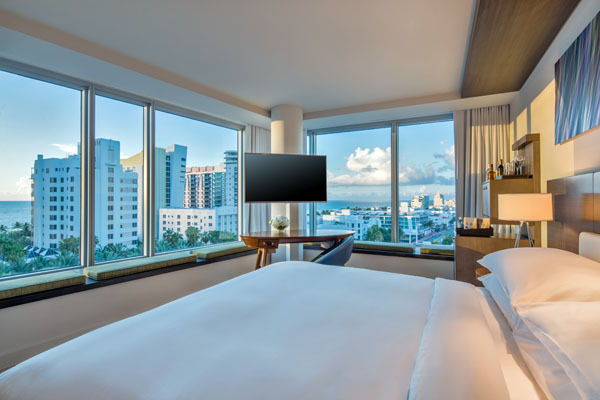 Choose from one of the 105 guestrooms including two suites that boast luxury and style with floor to ceiling windows filling the room with natural light and the colors of South Beach, including many hues of blue. Each room offers comfort with large beds, contemporary furnishings that complement the overall décor, and views of the Atlantic Ocean or the city. Don’t forget to bring your four-legged friends with you in this pet-friendly hotel which welcomes dogs with a bowl, a treat and in-room dog bed. With so many things to do in Miami, you might never want to leave. Guests will enjoy a myriad of activities close to the hotel and afar if you’re the adventurous type. 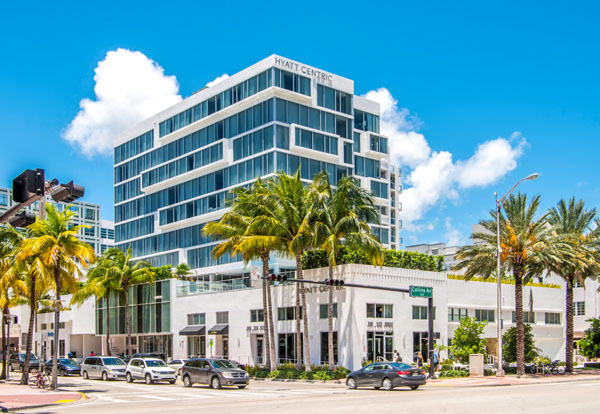 Lincoln Road Mall is just a 9-minute walk away from the hotel and is South Florida’s premier outdoor shopping, dining and entertainment destination. The mile long promenade boasts a happening street scene with waves of locals and visitors scouring for selfie hot spots, cafés, bars and beautiful architecture. Ocean Drive and Collins Avenue are two other great shopping destinations all within a 10-minute walk. If shopping isn’t on your mind, venture out and explore the city’s historic Little Havana neighborhood and Wynwood, the design district’s crown jewel. Guests will seek the best in street art as they make their way through the Wynwood art walk, discovering magnificent treasures along the way. Outdoors activities include everything from sunbathing, snorkeling and even world-class golf courses, which are all within reach. Excursions to the Everglades, Florida Keys and the Bahamas are also obtainable in this great location. As for dining, you can choose to stay in or venture out. 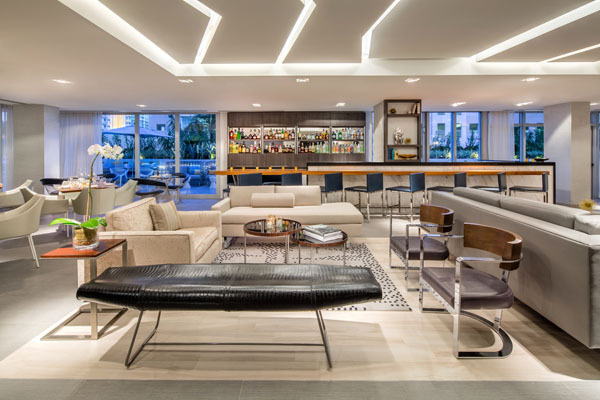 Hyatt Centric South Beach Miami features Spanish-Mediterranean cuisine helmed by the Chef Richard Pelliccia and his skillful team. DECK Sixteen is an indoor-outdoor patio space, featuring a bar service overlooking the rooftop deck pool. Guests can dig into a chorizo frittata and freshly squeezed orange juice for breakfast or enjoy a refreshing seafood salad for lunch and as for dinner, tapas is the hero with fresh seafood and meats. Revel in thoughtfully curated charcuterie board selections and signature sangrias, artisanal craft cocktails and an extensive list of eclectic wines. If you choose to dine out, the staff of locals will guide you to the best dining spots South Beach has to offer. Make wellbeing part of your stay at the Exhale Spa, the ultimate destination for spa and fitness for guests. This award-winning wellbeing mecca offers guests a chance to relax and unwind with deep tissue massage, facials, acupuncture, or the opportunity to breathe out with cardio and yoga classes. If you want that sun kissed glow opt in for the 90 minute spa therapy that will have you feeling new and improved ready to take on anything.